Until recently, the actinopterygian and sarcopterygian fishes seemed to be quite distinct clades. Now, a fossil from the Upper Silurian and Lower Devonian of China and Vietnam has provided a probable missing link. Psarolepis (Zhu etal., 1999) is known from many specimens from several localities. 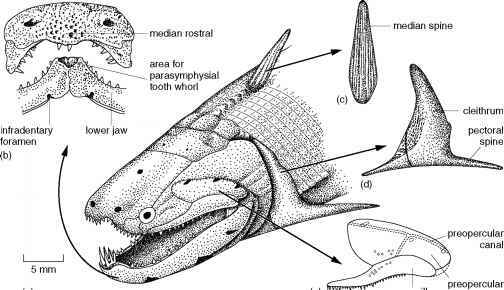 When it was first described, it was assigned to the sarcopterygians because the skull and jaws looked like those of primitive lungfishes and other Devonian forms. The cheek bones and the shoulder girdle, however, seem to share features of both osteichthyan groups. In the skull (see illustration), Psarolepis shows a mix of actinopterygian and sarcopterygian features. In the lower jaw, for example, there are three large infradentary foramina and evidence of a parasymphysial tooth whorl, a set of long, hooked teeth that pointed up and forwards. Both features are typical of porolepiforms and other sarcopterygians. The teeth are also sarcopterygian in showing multiple infoldings and in bearing cosmine. In the cheek region, Psarolepis has actinopterygian features: it does not have the squamosal elements seen in sarcopterygians, and the canal running along the preopercular bone has a ventral extension towards the maxilla. The three large openings in the preopercular bone, near the canal, however, are more sarcopterygian-like. There are also some characters that have never been seen before in the bony fishes: Psarolepis has a huge pectoral spine extending back from the shoulder girdle, and there is a median spine presumably located in the midline behind the head (see illustration). A pectoral spine like this is known in some placoderms and in acanthodians, and the median spine is known in sharks and acanthodians, but neither has been seen in other osteichthyans. Zhu etal. (1999) were unable to locate Psarolepis in the cladogram with certainty—they thought it was either the basalmost sarcopterygian (see Box 3.6) or the basalmost osteichthyan. The second interpretation has been confirmed as more likely by Zhu and Schultze (2001), because Psarolepis lacks the closed pineal opening and large quadratojugal of other osteichthyans, and it has a posterior pectoral process and paired pectoral spines, which are absent in other bony fishes. Long (2001) points out many similarities between Psarolepis and the Onychodontida, and places both as basal sarcopterygians. (e) >twrff maxilla a covering for the fin and they also stiffen it in comparison with sharks, for example, which have only actinotrichia. The scales are composed of layers of bone, dentine, and an enamel-like substance on the outside. The skull is relatively heavy, with a bony braincase and palatal elements inside, and an outer bony box made from numerous thin dermal bone plates. There is a large eye and two nostrils on each side, and a broad mouth lined with irregularly spaced sharp teeth (Figure 3.19(c-e)). The teeth are borne on three bones around the edges of the mouth, the maxilla and premaxilla in the skull, and the dentary in the lower jaw, and these are the main tooth-bearing elements in subsequent vertebrates. The palatoquadrate is inside the maxilla, and it is covered by palatal bones that also bear rows of teeth. At the back of the skull are the outer dermal elements of the shoulder girdle, attached to the gill region. The head skeleton of Cheirolepis is kinetic, that is, composed of several mobile units that can move against each other (see Figure 3.19(d, e)). When the jaws open, a very wide gape is possible because the five units move apart. The skull roof moves back, the gill region expands and moves back and down, and the shoulder girdle moves downwards. Cheirolepis was a fast-swimming predator that presumably used its large eyes in hunting, and possibly even in transfixing its prey before capture (Pearson and Westoll, 1979). Its great gape would have enabled Cheirolepis to engulf prey up to two-thirds of its own length; such prey would include the abundant acantho-dians, and small lobefins and placoderms found in the same beds. The sharp teeth of Cheirolepis might not seem suitable for cracking open placoderms, but there were shorter teeth on the palatal bones that might have been capable of moderate crushing activity. ably rather clumsy when trying to turn rapidly. The paired fins also functioned to prevent rolling. Devonian actinopterygians such as Cheirolepis are known from all parts of the world, but only a dozen genera have been found so far. The actinopterygians radiated dramatically in the Carboniferous and later, and they are the dominant fishes in the seas today (see Chapter 7). The Sarcopterygii were a more significant group in the Devonian than the Actinopterygii, although sar-copterygian fishes have since become much rarer (the clade Sarcopterygii of course includes all tetrapods). Sarcopterygians share muscular lobed paired fins with bony skeletons (Figure 3.19), as well as several skull features not seen in other vertebrates. There are two living sarcopterygian groups, the lungfishes (Dipnoi) and coelacanths (Actinistia), as well as numerous extinct clades, all of which arose in the Devonian. Relationships among the living and extinct sarcopterygian groups have been highly controversial (see Box 3.6). The lungfishes (Thomson, 1969; Bemis et al., 1986) were particularly diverse in the Devonian,but they have dwindled in importance ever since, leaving only three genera still living. Dipterus from the Mid-Devonian of Scotland (Figure 3.20) has a long body, as in the osteolepiforms, but the fins and skull bones are very different. The fins are pointed, with long central lobes supported, in the paired fins, by a rather symmetrical array of bones. The tail is heterocercal and bears a narrow fin beneath. The skull of Dipterus has a complex array of small bones around the large eyes and mouth. 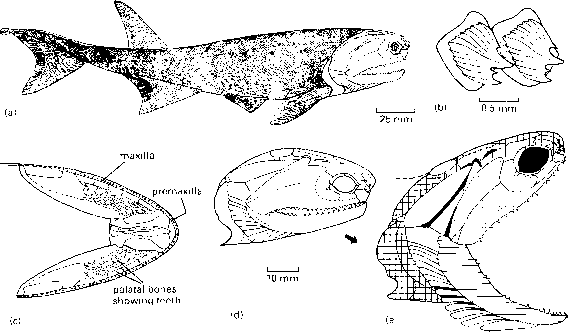 There are no teeth on the margins of the jaws as in other bony fishes, only a pair of large dentine-covered grinding plates in the middle of the palate (Figure 3.20(b)), and a scattering of smaller tooth-like structures in front. These paired plates are typical of later lungfishes and indicate a crushing function for feeding on tough and hard food. elaboration of the crushing tooth plates, and the development of a special hypermineralized dentine, all of which increased the crushing power of the jaws. The body shape changed too after the Devonian, becoming more symmetrical, and the tail also became symmetrical above and below the body. The three genera of living lungfishes (Figure 3.21) have reduced the bony parts of their skeletons. The braincase and parts of the backbone remain cartilaginous, and the outer skull bones are reduced in number and weight. The Australian lungfish Neoceratodus is deep-bodied and has broad pectoral and pelvic fins, whereas the South American Lepidosiren and the African Protopterus have stout, muscular, eel-like bodies and very slender, elongate paired fins.